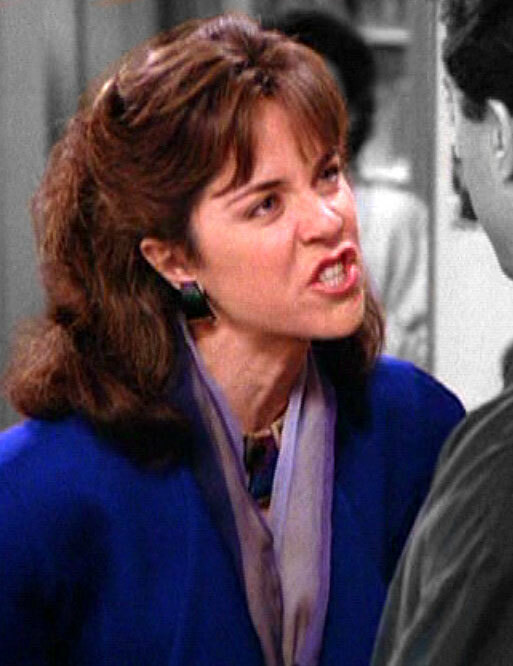 The second season of Seinfeld (1991) was a relatively short one, with only thirteen episodes*, but it did contain some classic Lainey moments, such as her first “Get out!” shove (ep #2.5 “The Apartment”), conspiring with George to slip his former boss “a mickey” (#2.7 “The Revenge”), and frantically attempting to pack an unwelcome house-guest’s luggage and get him out of the city in record time (#2.12 “The Busboy”). Weirdly, in that episode’s “Inside Look” featurette, Julia Louis-Dreyfus is very critical of how she played the packing scene, and wishes she could go back to reshoot it… but I think she’s fantastic, so shush to her. This season also introduced Elaine’s intimidating father ‘Alton Benes’, played by Lawrence Tierney (#2.3 “The Jacket”)… and while everyone praises the actor’s performance, they also suggest that off-camera he was (as JLD puts it) a bit of a “nutjob”. An incident involving a stolen kitchen knife from the set of Jerry’s apartment left everyone very nervous around him, and he was never invited back to reprise his role… which is a shame (from my selfish perspective) because we see a lot of Jerry and George’s families over the years, and precious little of Elaine’s. Even more momentously, the finale sees Jerry and Elaine negotiating what would now be called a “friendship with benefits”, before resuming a full-blown romantic relationship (#2.9 “The Deal”). Swoon! They actually do make a very cute couple, and George’s giddy enthusiasm for them was very sweet… but it would have been a very different show if they’d stayed together long-term, so I can’t say I’ll be too broken-hearted to see them both back on the singles market in the next season. Once again, there weren’t many notable supporting actresses here… I mean, plenty attractive women who played their parts well, but none who went on to become household names. That said, I did enjoy Margaret Reed’s intense turn as a scorned one-night-stand of Jerry’s, who confronts him at a party (#2.10 “The Baby Shower”)… and Siobhan Fallon’s debut as Tina’s musical-loving room-mate ‘Linda’ in the finale was fun too. According to IMDb, Lauren Bowles appeared as an uncredited extra in ep #2.5 as a ‘Blonde Longhaired Woman’ (presumably during a party scene? ), but I can’t say I spotted her. Oh, this set also included my fave easter-egg of the series, with a hidden Inside Look at an unaired episode called “The Bet”, which revolved around Elaine buying a handgun! Larry Charles wrote the script, and it got as far as a table-reading with the cast, but JLD (among others) was very uncomfortable with the material, and it never went any further than that. Interesting stuff, though. * Technically “The Stranded” was produced as part of this season, and is included in this boxset, even though it actually aired as part of the third season (#3.10)… where it had to be preceded by a special introduction warning viewers about major continuity errors, such as George still working at the real estate office he’d previously stormed out of! This entry was posted in Rants about TV and tagged Elaine Benes, Julia Louis-Dreyfus, Lauren Bowles, Margaret Reed, Seinfeld, Siobhan Fallon. Bookmark the permalink.